Find timeless cushion covers online. Choose your favourite style & size. Charming cushion covers and throw pillows aren’t easy to find. And even if you do spot one on your weekend trip to a homewares store, chances are it’s mass-produced. While your guests might not know, you will. Just like what you wear is a reflection of your personality and taste, the way you dress your home is, too. Give your lounge room a cultural wow-factor with statement cushion covers. You’re searching for cushion covers online because you want something unique, instead of a product that thousands of other homes have. Every Lotus Handicraft cushion cover series are one-of-a-kind and different from the next. For the lover of homewares and interior design. You’ll appreciate the impact of unique art décor. An Australian company, with Middle Eastern kilim artists. Forget third party websites, searching for cushion covers online. Go straight to the unique source. Got questions? Ask our local customer service team. We post anywhere in the world, fast! That Middle Eastern rug look & feel, in a cushion. Stylishly unique. Affordable and backed by a warranty. If only Google knew exactly what you wanted when you search for throw pillow and cushion covers online. But many of those big, third party websites just cater to the masses. You’ll see that cushion everywhere in blogs and Instagram photos. How many people can say they’ve got products from the Middle East? Not many. This feeling of uniqueness is what we want to emulate with our cushion covers. Produced by local kilim masters, every elegant cushion is made 100% in the Middle Eeast – the world’s leader in this beautiful art work. Who said art has to hang on walls? With Middle Eastern cushion covers. Do you want to introduce new interior design pieces to make a splash or a stylish statement? Adding large items of furniture isn’t always feasible and sometimes, especially when you simply want to make small changes. Cushions, rugs, and trinkets are a great way to achieve this. You don’t have to spend a lot to update the energy and vibe of a room. Throw a couple of colourful cushions into your living room and it’ll bring it to life. Consider the style you’re going for and the feeling you want to give your guests as they walk in. Is your living room currently quite minimal with lots of white space? Perfect. The colours and patterns of a unique cushion will add dimension and personality to it (without taking away from the simplistic energy). Cushions are popular given that they’re so interchangeable. You can move them around the house – from your living room to the office or your bedroom. They also work well in kitchen spaces, on top of stools. Think about wherever you’d like to add colour and impact, then see if the cushion fits. Mix and match it with the items you’ve already got in the room that give the space its energy. One of a kind cushion covers. Yep, you’ll be the only house with it. So, our cushion covers. If you’re looking for styles that have personality and ‘pow’ factor and aren’t like the standard ones you see at chain stores, you’re going to love Lotus Handicrafts designs. Our cushions are handmade with love, by local, Middle Eastern women, using earthy, environmentally-friendly materials, sourced from quality, local market suppliers. Every cushion in our range is consciously made and you exactly where it came from. And the best part? There’s no other cushion in the world like yours. Because we don’t source huge amounts of the same fabric or produce en masse, your cushion carries even more individually than you think. 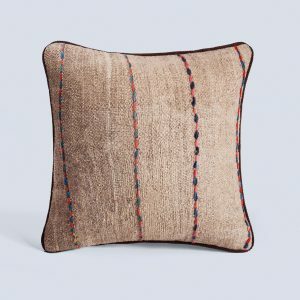 But one thing’s for sure – our authentic kilim cushions and pillows will complement any décor. Get ready for your friends and family to ask you where you got that cushion cover from. Lotus cushions are stylish and colourful, with intriguingly eye-catching patterns. And even if your bestie wants to buy the same cushion as you have, they won’t be able to. Sure, we have similar colours and patterns, but it won’t be an exact replica of yours. If you have an affinity for vintage, boho or retro, you’re going to love our range. You know when you’re perusing your favourite weekend markets or vintage store, and you find that hidden gem? Well, this is the feeling you’ll get when you see your new Lotus Handicrafts cushion cover. You’ll fall in love with it instantly – its colours, patterns, size and textures. It’s impact on your space and the feeling it evokes. Once you see it, online and when it’s in your hands, you’ll quickly imagine how and where it will fit in your home. Maybe it’s perfect for your living room for starters, then into your bedroom for a while. Right now, your bed already has a colourful quilt, but you plan to change this soon. When you do, and if it’s a simple colour scheme that’s mainly white, a colourful throw cushion would be the perfect focal and final touch. And, you don’t have to travel far (or anywhere, buying them online), for adorable cushions. You know your interior design is a reflection of your own personality. So, every product that you choose to add to your space is important and tells a story. Oh, and comfort and material quality is essential, too. In rooms like your loungeroom, living area and bedrooms, this is really important. After a long day at work, all you want to do is come home and lay out on your couch (with a cosy, soft cushion to rest your head on, of course). This is where a material like Kilim comes in. When we design each cushion cover, we focus on both the style and feel, equally. We don’t just want your stylish cushion to be a purely decorative piece. It should be something that you love to use, too. Kilim is a weaving technique that produces geometric designs. The fabric is traditionally made up of earthy tones and produces an exotic, Middle-Eastern look. But not at the cost of your comfort. Cushions that tell your design story. Don’t try to navigate the waters of websites like Etsy. While this is a popular online platform for individual makers, products are sold in bulk. Our customers tell us they prefer the simplicity of having an online store with one-off designs and only a few dozen products. You won’t need to worry about not finding a design you like. We have something for every vintage or boho taste. Look at these two cushion covers and the see how different both designs are. The first is charmingly simple, featuring beautiful earthy colours in the stitching. If you’ve already got vibrant colours in the space, this is a great cushion choice. But if you’re looking to make a splash, something like the second design would pop. While there’s six or seven colours in the cushion, the bold design doesn’t feel too busy. Do you have a couch that’s one tone? Simple furniture surrounding it? The Anna Vintage will add an energy to it. Browse our wide range of cushion covers online!